I've been a Christian for 11 years and five months. I've been a gospel preacher for 11 years and two months. So 'faith' should come easy for me, right? Believing in God is a given, right? I'm a human being. I live in a physical world. I live in a world that challenges my faith in Christ and constantly tells me that it's unreasonable to believe in something I cannot see or prove using clear, physical means. Not only that, but my flesh and spirit are at war, and my flesh (with Satan's help) looks for every excuse to justify sin and disbelief. While there are times when my faith in Christ is strong, I would be lying to you if I said that I never have doubts. And let me tell you something, those moments can be very uncomfortable. What do I do when my faith is weak? Should I study my Bible more? Should I pray more? Should I confess my weakness and struggles to brethren who can encourage me, counsel me, and pray for me? Yes, yes, and yes. But can I be honest with you about something? I'm ashamed to say this, but these things don't always bring me fully back. What has helped me more than anything else has been the message of Hebrews 12:1-2. It's so easy to forget that men like Noah, Abraham, Moses and David really lived. Not only that, but these were real people who really believed in God. And they believed in Him so much that they were willing to sacrifice everything for Him. Literally. Noah stood alone as a "preacher of righteousness" (2 Peter 2:5) in a very wicked world. Abraham was willing to leave his homeland and even sacrifice his only son. Moses "[chose] rather to suffer affliction with the people of God than to enjoy the passing pleasures of sin, esteeming the reproach of Christ greater riches than the treasures in Egypt; for he looked to the reward" (Heb. 11:25-26). The prophet Obadiah risked his life for hundreds of other prophets during the time of the wicked, tyrannical Jezebel all because he "feared the Lord greatly" (1 Kings 18:3-4). When Job lost everything, he said, "For I know that My Redeemer lives, and He shall stand at last on the earth; and after my skin is destroyed, this I know, that in my flesh I shall see God, whom I shall see for myself, and my eyes shall behold, and not another.How my heart yearns within me!" (Job 19:25-27). The prophet Jeremiah was cast into a dungeon for preaching God's word. "In the dungeon there was no water, but mire. So Jeremiah sank in the mire" (Jer. 38:6). When Shadrach, Meshach and Abed-Nego were called before the King of Babylon and commanded to worship his idol, they replied, "O Nebuchadnezzar, we have no need to answer you in this matter. If that is the case, our God whom we serve is able to deliver us from the burning fiery furnace, and He will deliver us from your hand, O king. But if not, let it be known to you, O king, that we do not serve your gods, nor will be worship the gold image which you have set up" (Dan. 3:16-18). Jesus really died at the hand of Pontius Pilate! Stephen, when his death was imminent, siad, "Look! I see the heavens opened and the Son of Man standing at the right hand of God!" (Acts 7:56). And when they stoned him to death, making him the first Christian martyr, he cried out, "Lord Jesus, receive my spirit" (vs. 59). James the brother of John was killed with the sword (Acts 12:2). 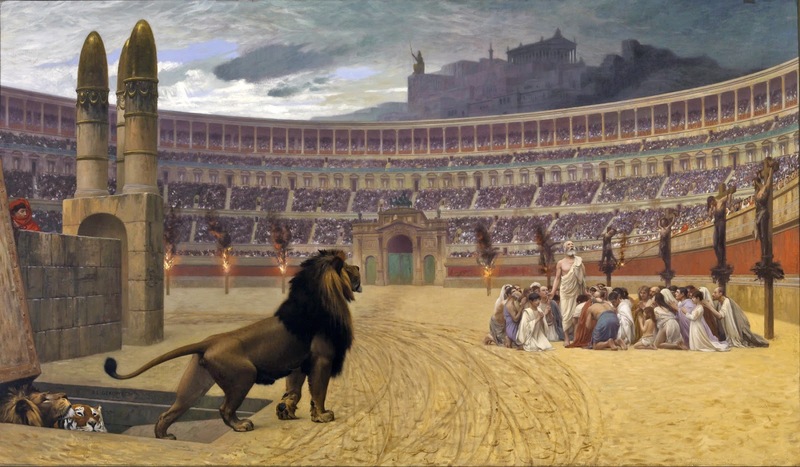 And let's not forget the millions of Christians who were burned alive, made into human torches, fed to the lions, slaughtered during the Inquisition...and even the countless saints today who are being persecuted in foreign lands (watch this video). No faith has radically transformed lives more than the Christian faith. No faith has inspired such deep, unwavering conviction as has the Christian faith. For thousands and thousands of years, men and women all over this world have believed so strongly in the God of the Bible that they have given Him their very lives...not to be rewarded with virgins in paradise, but just to be in the very presence of this God whom they love ardently and passionately. What I take away from Hebrews 12:1 is that when my faith is weak, I can be inspired by the faith and conviction of untold millions who have firmly stood in the face of incredible adversity with the hope and love of God - the same God I serve - driving them onward and upward. I am surrounded by a "great cloud of witnesses." And boy...how incredible - HOW INCREDIBLE - it is to know that one day - ONE DAY - I'll be with all of them before the throne of God above.